Prof. Kyung-Tai Min (front) and Postdoctoral researcher, Wei Wang (back) of Life Sciences are examining axons by confocal microscope. An international team of researchers, affiliated with UNIST has pinpointed one common molecular mechanism that may protect people with Down syndrome and other intellectual disabilities. 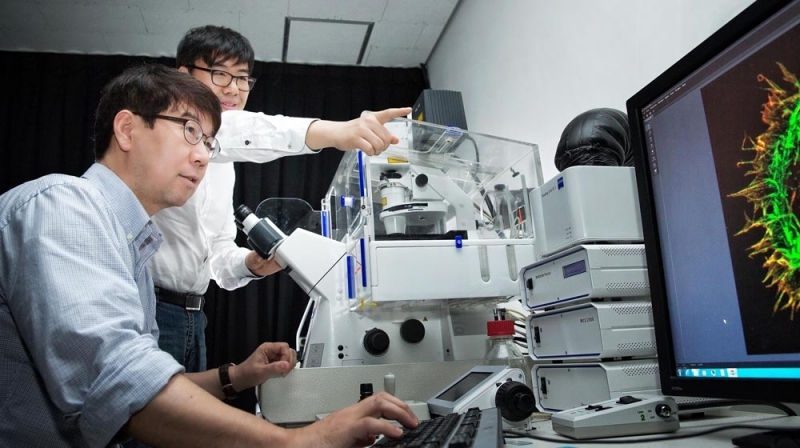 This breakthrough research has been led by Prof. Kyung-Tai Min (School of Life Sciences) and his research team at UNIST. The results of the study have been appeared in the May 23rd issue of JCB (Journal of Cell Biology), a world renowned academic journal in the field of cell biology. In the study, the team investigated the functioning process of the protein Down syndrome critical region 1 (DSCR1). They found that DSCR1 plays a crucial role in understanding the underlying cellular and molecular networks in dysfunctional neurons affecting distinct brain functions. Schemic image, showing DSCR1 is necessary for axon development. In experiments on mice, ones that lack DSCR1 showed the impeded axonal growth cone turning in neurons, as well as the delayed axon development. In experiments on mice, the research team found that mice lacking DSCR1 showed the impeded axonal growth cone turning in neurons, whereas mice with neurons overexpressing DSCR1 show excessive axonal growth cone turning. In addition, the axons of neurons lacking DSCR1 display delayed axon development, whereas those of neurons overexpressing DSCR1 extended at a faster rate. The research team further explained that Down syndrome seemed to occur the most when DSCR1 gene was markedly abundant, and also discovered an interactive relationship between the gene for protein DSCR1 and genes of proteins that cause other mental disabilities. “Our research results will help find the common cause of mental disabilities and also provide the foundation for understanding mental disabilities such as Down syndrome,” says Prof. Min. This work has been supported by the Brain Research Program through the National Research Foundation of Korea, funded by the Korean Ministry of Science, Information and Communications Technology, and Future Planning. Wei Wang, Asit Rai, Eun-Mi Hur, Zeev Smilansky, Karen T. Chang, and Kyung-Tai Min. “DSCR1 is required for both axonal growth cone extension and steering”, JCB, (2016).